Google’s latest mobile marketing direct mail brochure (of which we receive many) promotes their Adwords product for Search Engine Marketing (SEM) – commonly called pay-per-click advertising for search engines – on smartphones. And we see opportunity here for our Austin online marketing clients. Google is right to promote mobile SEM! According to Google, mobile searches have grown 400% since 2010 – a fact we have already noted: Use of Mobile Devices For Search is Surging. Here at MARION, we have seen the effect of mobile search. As part of our Internet marketing services for customers, we track how people access our customers’ websites. 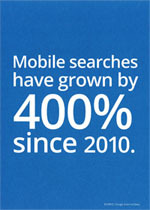 The fact is that we have seen an astonishing increase in the use of smartphones for web searches. For local business sites, the proportion of people using smartphones to find local services can reach as high a 20%. “With just a few easy steps, you can bring more people to your business. Get more clicks. People search on phones differently than they might on a computer. Adding text for people on the go, like “Visit our store today” or “Call Now”, can make a difference. A mobile campaign can boost the number of people clicking on your ads by as much as 11.5%. Get more visitors. When people are on the go, they’re often looking for businesses that are close by. Make it easy for customers to find you by giving them directions to your business. On mobile search results, Google typically displays 2 ads at the top and 3 at the bottom of each page. This compares to PC (non-mobile) searches with 3 at the top and many on the right side of the page and perhaps a couple on the bottom too. Google keeps changing the PC format, but we can safely assume that there will always be many more ads displayed on PCs than on mobile devices – where there is simply not the space. This means less competition to get noticed for mobile advertisers! Most importantly (which Google does NOT mention in their direct mailer) is that Google per-click-rates on mobile are actually less than that of non-mobile searches – at the moment! Google also recommends that your site be mobile friendly. Make sure you site has a mobile friendly design so that when visitors do visit your site they can view it on smartphones easily and get the information they want fast.